I haven't read anything by Atul Gawande since his first book, Complications: A Surgeon's Notes on an Imperfect Science, which I loved. His newest takes on the end of our lives, something I've been thinking about a lot lately (see: Smoke Gets In Your Eyes) so I was eager for this book. It did not disappoint. Gawande discusses various options for end of life care, including assisted living, nursing homes, and hospice, and a bit about the history of each of them and how we went from taking care of our sick and elderly at home to our current system. We all know how much people resist leaving their homes to go to nursing homes, or even assisted living, but here he gets into why that is - it seems obvious, but it's actually complicated and breaking it down can help inform ways to make nursing homes better places. Of course he talks about the role of medicine in extending our lives - though often not the quality - and how terrible medical personnel are at having conversations about health care and end of life issues. Some of this I knew first hand, which I suppose is one of the reasons I was so interested in this book. 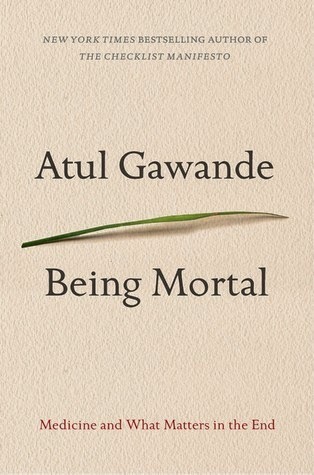 A couple of years ago, my mother died after an illness and I recognized so many things Gawande discusses in the book from that experience. For instance, aging (or illness) isn't just a steady decline, but a series of setbacks that are each treated as they come along, offering temporary relief until the next one occurs. It's very up-and-down, even though the trajectory is, overall, a downward one. I also recognized the way medical staff tend to treat these particular conditions, but seem to forget the person in front of them, and even the larger context of the person's overall illness and decline. When they talk, it sounds more like a medical lecture than a conversation with a person who is ill. A family member would always try to be with my mother when things were explained to her, but even though most of my family work in hospitals or elder care, even they would be confused. In fact, when Gawande's own father was dying, his family were subject to one of these conversations. He says "The discussion became difficult for me or my parents to follow, despite all three of us being doctors." Now imagine being alone with the doctor having this conversation, especially if you are extremely ill. How is anyone to understand what is going on? And how can you then make difficult, life-or-death decisions? The conversations should follow a different path, Gawande says, one that makes more sense to the patient and gets at the fundamental truths needed. Doctors should ask their patients what their goals are, how much they are willing to endure, and what trade-offs they are willing to make. In one example, a man faced with possible death or paralysis says that as long as he can watch football and eat chocolate ice cream, then he is ok with surgical risks. Others may only want to live if they can still walk. By having this conversation up front, the smaller and more specific decisions that will come up later will already have been made. This also requires an honesty that many doctors aren't willing to employ, as relentlessly optimistic as some of them are determined to be. Gawande says that doctors have been mistaken that their job is all about ensuring health and survival, and that in fact it should be about well-being, and that means a focus on our reasons for being alive. He talks a lot about the loss of independence many experience when they are elderly, because nursing homes are so hyper-focused on health and safety with no regard for the larger picture. Patients are put on strict schedules, carefully monitored diets, and made to stay in wheelchairs so they don't fall and get hurt. I think any normal adult would resent being infantilized this way and I know that I, for one, intend to eat and drink whatever the hell I want when I'm old. If there's any time in our lives when we should be able to have a chocolate cake and a cocktail for dinner, it's when we don't have much time left. Shouldn't that time be filled with the things we enjoy? Shouldn't we walk while we still can, rather than sitting and letting our muscles atrophy? To hell with safety. Life isn't safe. But Gawande offers hope in his examples of facilities that have been dedicated to helping residents retain independence and dignity. These places try to be like home, with plants, pets, and onsite daycares so residents can interact with children. Some have locks on doors to retain privacy, and no rules about, say, drinking alcohol or having overnight romantic guests. I cannot think of a more ideal place to finish living than one that doesn't require trading off all the pleasures in life in order to get some assistance. I could go on. There is so much in this book to think about and discuss, and it's pertinent to all our lives, even if we prefer not to acknowledge it. What Gawande writes about is so important, especially as medicine advances and we live longer. It's becoming ever more crucial to examine what it means to extend our lives in terms of the quality of the time we have left. I hope many who work in health care read this book, or at least somehow adopt these ideas. I highly recommend this to anyone who may be concerned about what things will be like at the end of life, or who has the same worries about their loves ones. So basically, if you are a person, you should read this.